So you’ve checked out Jazz in the Morning, made some playlists on Spotify, and shoot, maybe you even caught my show on Tuesday night (one can dream, right?!). But you want more! Maybe you’re just looking for a different experience on a night out. Maybe something a little more low-key than the typical liquor-soaked saunter down Mass. Street followed by a nice aspirin sandwich is in order. More simply (and without my assumptions about your drinking habits), a night in KC can be a nice change of scenery. Keyboardist and composer Brad Cox leads The People’s Liberation Big Band the first Sunday of each month at the recordBar in Westport. Their music is a raucous mix of something close to Frank Zappa-meets-Charles Mingus. Outside their regular gig at recordBar, they have made a recent tradition out of morphing into the pit orchestra for the Owen/Cox Dance Company’s modern dance rendition of The Nutcracker and the Mouse King. It’s definitely worth your time come holiday season. Whatever expectations you may have, please check them at the door. drummer Zach Albetta, plays a mix of standard and original modern jazz, with covers of contemporary music like Radiohead. In the last several years, Lowrey has increasingly collaborated with local hip-hop artists as well, backing up MCs with electric keyboards and a full rhythm section. I have to admit, this group might not be for everybody, especially if you’re just getting into jazz. 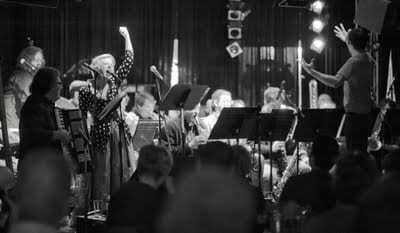 Crosscurrent dedicates itself to the music of Lennie Tristano and his musical disciples. For someone with a more developed jazz taste, I can’t recommend this band enough. Matt Otto and Steve Lambert are two tenor saxophonists with contrasting approaches, backed up by pianist T.J. Martley, bassist Zach Beeson, and drummer Sam Wisman. For relative newcomers to the jazz genre, this band’s music can at times come off as dry or academic. I include them in this list because I happen to love the music of Lennie Tristano, and any one of the musicians in Crosscurrent is worth seeing in another group, but bring them all together, and I’ll definitely be there. They have a blog, too! screwed on straight. But sometimes you have to say f*** it and see what happens. making. Listen to a full show by Alaturka on KCUR’s website. KC Jazz Connection airs every Tuesday from 8-9 p.m.